By the end of the 13th century BC all traces of human presence had vanished on the island. The next settlers were the Phoenicians, a civilization that had an enterprising maritime trading culture spreading across the Mediterranean during the period of 1200 BC to 900 BC. In the 9th century BC, Lacedaemonians (Dorian Period) came to the island and founded the city of Ancient Thira on Mesa Vouno. They named the city and the island after their Spartan commander and leader, Theras. The island of Thera became an important crossroad between the east and west, while Therans journeyed further afar to the coast of North Africa, where they colonized and founded the Ancient City of Cyrene (in modern day Libya). At this time the Phoenician alphabet was adopted for written Greek. (The Greek alphabet in turn gave rise to the Gothic, Glagolitic, Cyrillic, and Coptic, as well as the Latin alphabet). During the reign of the Holy Roman Empire and the early Byzantine years Thira did not play a significant political or military role. Christianity first appeared on the island during the 4th century AC, and the Church of Panagia Episkopi was built in the late 11th Century by Byzantine Emperor Alexios A’ Kominos. After the fall of Constantinople to the Crusaders of the 4th Crusade in 1204, Marco Sanudo conquered the Archipelago and founded the Duchy of Naxos (also known as the Duchy of the Aegean). Marco Sanudo ruled from 1207–1227. He made the headquarters on island of Naxos, and Thera was made the seat of one of the four Catholic Bishops of the Duchy. During this period Santorini expanded economically with cotton and grape cultivation. It also had considerable problems with pirate raids, internal problems with quarreling rival rulers and political problems that arose from differences between the Duke of Naxos and Sultan Suleiman the Magnificent (Born: November 6th 1494 - Died: September 5th/6th 1566). Marco Sanudo gave Thira and the island of Thirassia as a fief to Giacomo Barozzi, whose descendants ruled the island (excepting a few short intervals) until 1480. Barozzi built the original Castle of Skaros 'La Roka'. 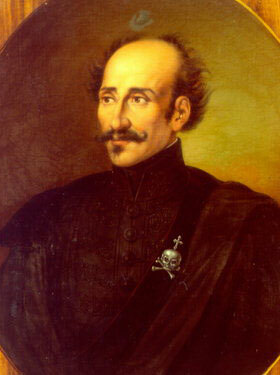 In 1480 the Duke of Naxos was Giacomo Crispo. He decided to give Thira as a dowry on the event of his daughter Fiorenza's marriage to Domenico Pizani, son of the Duke of Crete. Shortly after the death of Giacomo Crispo, the island was taken over by his brother Gianni and reinstated to the Duchy of Naxos. Around the year of 1537, Thira followed the fate of other islands in the Aegean - it was repeatedly raided by the Turkish privateer and later admiral of the Ottoman fleet, Barbaros Hayreddin Pasa (also known as Hizir Hayreddin Pasa), who had dominated the Aegean for decades. Barbaros Hayreddin Pasa was born on the island of Midilli in 1478 (Lesbos in modern day Greece) and died in 1546 in Istanbul. 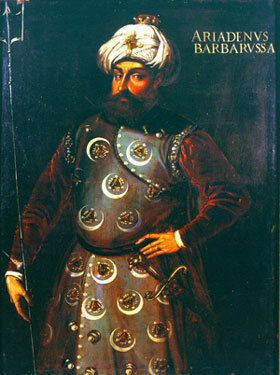 Barbaros Hayreddin Pasa snatched the islands of Kea (Tzia), Mykonos and Thira from Venetian rule and forced the local ruling parties to recognize the sovereignty of the Sultan. Thira was finally relinquished to the Turks in 1566. Turkish Dominion resulted in the abolition of piracy and the development of international trade. 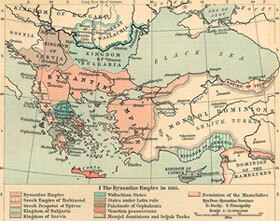 The Ottomans ruled Greece until the early 19th century. In 1821 the Greeks rebelled, and Santorini, with its large fleet of ships took part in the revolution. Evaggelos Matzarakis, a sea captain raised the Flag of Independence in Santorini on the 5th May of the same year. Greece declared independence, but did not succeed in ratifying it until the Treaty of Constantinople in July 1832. Santorini was annexed to Greece in 1912. Until the beginning of the 20th century Santorini had a thriving shipping trade, with major wine, tomato and textile exports. However with the introduction of steamships, island factories moved to the mainland, causing a serious blight on the local economy. On the 18th October 1944 Santorini was occupied by German and Italian forces. The villages of Pyrgos and Karterados have memorial plaques to commemorate those who died in the Second World War. The earthquake of 1956 and the volcanic eruption that followed was an economical and social catastrophe for Santorini. 85% of the island structures were destroyed, there was a large decrease in local population and Santorini did not start to revive itself until the end of the 1970's with the introduction of the tourist industry. Today Santorini is one of the most popular holiday destinations worldwide. 16th century contemporary painting, Louvre Museum, Paris.